As Frank Ocean’s minimalistic 2016 opus, “Blonde,” eclipses its two year anniversary, Ocean finds himself leagues above his contemporaries in both experimentation and fulfillment. If “Blonde” isn’t considered a classic by now, it will surely be crowned one in the near future. Ocean’s simplistic approach is integral in assembling one of the most abstract pieces of mainstream art during this decade. Straying from the norm of overbearing production and run of the mill lyrics, Ocean serenades us for an hour over some of the most barrenly beautiful instrumentals within the art pop genre. Specifically, a trio of tracks at the tail end of the project, “White Ferrari,” “Seigfried,” and “Godspeed,” exemplify this approach. “White Ferrari,” the first of three tracks, finds Ocean recollecting a childhood relationship and the affinity he still holds for the other person. The story is sung brilliantly over only a desolate opening instrumental, a light guitar in the second and third legs, and Ocean’s background vocals. This duality across “Blonde” comes in the form of mood. Tracks like “Pink+White” and “Self Control” both radiate this springtime/summer-esque feel that’s hard to find in the latter half of the track list. Despite the stark shift in mood, simplicity reigns supreme across the album. 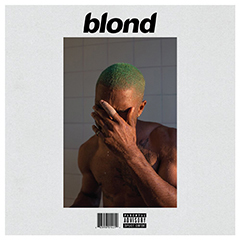 “Self Control” is backed by a simple guitar instrumental for the first half, where Ocean sings about the disconnect between his loved one, followed up by his inability to use his “Self Control.” The finale of this track is one of the more chilling moments across “Blonde,” an acceptance of his loved one’s departure. “Pink+White” is instrumentally the most beautiful track on “Blonde” and possibly across Ocean’s entire discography. The beat is a little more involved than most, but is at most some strings, a piano, and some light drums. Ocean’s singing accompanied by Beyoncé’s background vocals culminate into a masterpiece of art-pop. “Nights,” “Solo,” and “Skyline To” are also some high watermarks across “Blonde.” “Solo” and “Skyline To” thrive as spacey, minimalistic contributors to the aesthetic Ocean strives to achieve across the project. “Nights” is the fan favorite from “Blonde,” a track that literally divides the album (as the beat transitions, the album is split into thirty minute halves). “Nights” is beautiful across both distinct halves of the song, dealing with both personal disconnects and tragedies such as hurricane Katrina. “Blonde” excels in both its cohesiveness and conceptuality. Ocean’s thorough approach to songwriting, album structuring, and instrumental experimentation is similar but marginally better than his previous efforts on “Channel Orange.” Recent tracks like 2017’s “Chanel” find Ocean pushing the envelope yet again. Frank Ocean has been making waves for a while now–the upcoming years should be at high tide.